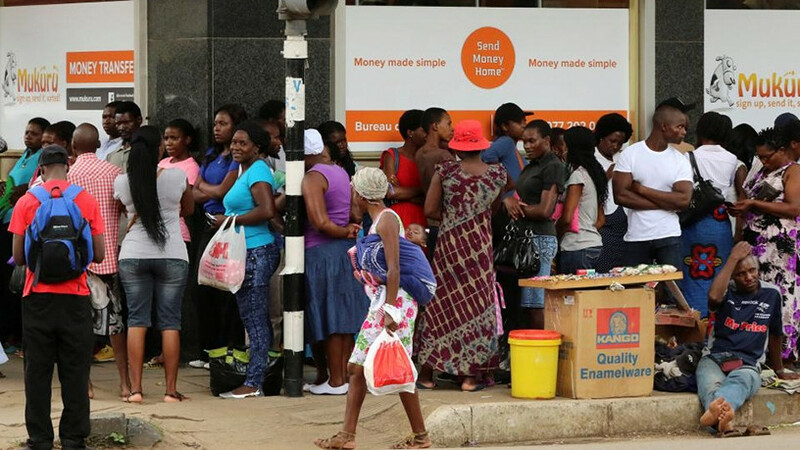 People queue to withdraw money from a bank in Harare. For most investors around the world, Bitcoin is a volatile and highly speculative bet. For Zimbabweans, however, the crypto-currency seems to offer rare protection from the onset of hyperinflation and financial implosion. Some are turning to Bitcoin out of desperation as their bank deposits lose value almost by the day, while others use the online currency for housekeeping such as funding family members studying abroad. The result is startling. Bitcoin's global surge to a record high of $7 888 last week ? a sevenfold increase since the start of the year ? has been spectacular enough. But on Harare's Bitcoin exchange, Golix (golix.io), the price hit $13 900, a 40-fold jump in the same period. "I have now changed all my reserves to Bitcoin because that is the only way I can protect my investment," said Arnold Manhizwa, who works for an IT and telecoms company in Harare. After a period of relative stability, acute shortages of dollar cash have set in, leaving Zimbabweans with electronic units in their bank accounts which are officially called dollars but have a far lower ? and rapidly decreasing ? value. In January, if they wanted to buy $100 in cash they had to transfer $120 out of their account to a seller on the parallel market. Now the price is $180 in what are nicknamed "zollars". Nearly all domestic transactions are made via debit card or transfers using mobile phones. But some economists estimate inflation is more than 50% a month in zollar terms, far from the official, dollar-calculated rate of 0.38%. Zimbabweans are therefore piling into anything they think might retain value. Prices of cars, real estate and stocks have all soared, with the Harare bourse's main industrial index doubling in the last two months. For people like Manhizwa, a 34-year-old father of two, Bitcoin is almost a safe-haven asset. "If I have $500 in the bank I won't get it back and I will be losing value, but when I have my Bitcoin it is going up every day," he told Reuters. Manhizwa, who participates in online chatrooms discussing crypto-currencies, says he deposited $20 in Bitcoin for his newly-born daughter a few months ago. Now it's worth over $200. "If I put that money in a bank right now in Zimbabwe I will be left with nothing," he said. Globally, the value of all crypto-currencies is more than $170 billion, and Bitcoin, the biggest and best-known, has outperformed all traditional currencies every year since 2011, except for 2014. But many international investors still view it as an opaque instrument used by gun-runners and drug-dealers on the Dark Web that should be avoided. The risks are clear. After reaching the record peak, the international price of Bitcoin slid over $1 000 in less than 48 hours last week. In Zimbabwe, the Golix exchange's Web site showed at one point on Sunday that the price had tumbled below $11 000, a drop of around 8% in 24 hours. But all this has to be compared with the zollar. "Many people view Bitcoin, despite its volatile nature, as a better store of value," said in-house Golix crypto-currency analyst Taurai Chinyamakobvu. In Zimbabwe, Bitcoin's attraction looks set to endure after Mugabe fired vice-president Emmerson Mnangagwa last week, paving the way for his wife, Grace, to get to the front of the queue to succeed the 93-year-old. Besides acting as an inflation hedge, Bitcoin's attraction to Zimbabweans lies in the difficulty of making foreign payments due to banks capping or halting transactions by MasterCard and Visa cards. "A software developer that wants to buy a software download would never get that prioritised by their bank. They can use Bitcoin to make payments," Golix said in response to Reuters' questions. "Others use it to send funds to their children in schools outside the country." One analyst who is setting up a Bitcoin trading desk at a Harare bank acknowledged the local price appeared attractive, but added: "Once foreigners sell their Bitcoin, they won't have a way of getting their money out."